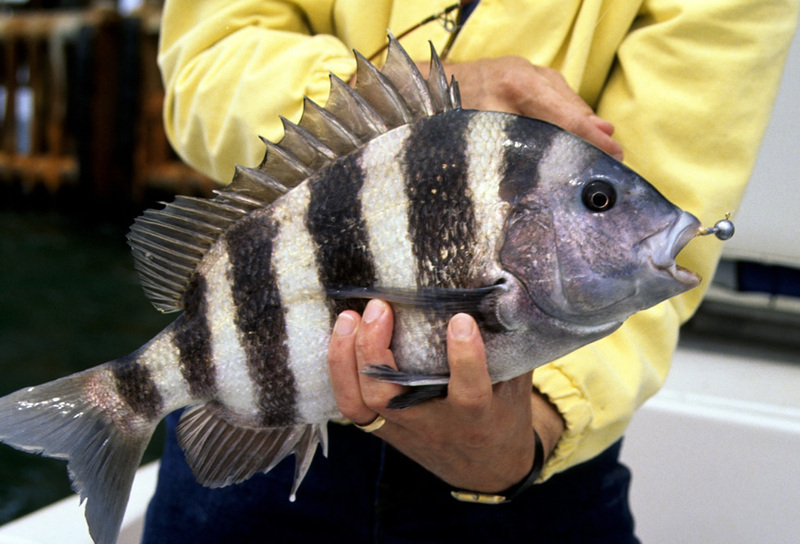 Some say the sheepshead is the saltwater equivalent of a master pickpocket. When a fisherman presents his bait, this black-banded cousin of the porgy comes up and steals it, nibbling it off the hook like a kid eating a Popsicle from around a stick. The fisherman never feels a thing, never knows the fish has cleaned his rig. Perhaps these things are true. Perhaps in some waters under some conditions, sheepsheads do a first-rate job of giving anglers the slip. But on one November day, I watched as Captain Bill McCaughan coached two first-time sheepshead anglers, ages 9 and 14, on the finer points of catching these buck-toothed bandits. Following his instructions, my sons Jared and Josh managed to land almost 100 2- to 5-pound sheepsheads during a half day fishing around offshore oil rigs. McCaughan stopped at the first rig and began his lesson. “How will I know when I get a bite?” Josh asked. The strong fish circled, trying to wrap the monofilament around the barnacle-encrusted support, but Jared kept a tight line and doggedly pulled the fish away from the refuge of the pilings. “I’ve got one, too!” Josh whooped. The boys enjoyed quite a battle on the medium spincasting gear they used. But soon, both fish were netted and flopping on the deck. “Now, let me show you something important,” McCaughan told the boys. With some fishing pliers, he retracted the lips on one of the fish. “See those big chompers. Get your fingers too close, and they’ll bite one off. Their spines are dangerous, too. They’re sharp as icepicks. So be careful. We’ll remove the hooks with these pliers. Lessons learned, the boys returned to fishing. And over the next three hours, as we moved from oil rig to oil rig, they caught sheepsheads one after another after another. For a couple of country kids, it was a little like heaven. McCaughan, now retired, guided many clients to big catches of redfish, cobias, speckled trout, red snappers and other popular saltwater sportfish. But when it was quantities of fish his clients wanted, likely as not, McCaughan would suggest they try for sheepsheads. Regardless of the rig that’s used, McCaughan recommends a light touch when setting the hook. In some areas, anglers attract sheepsheads by chumming with ground-up shrimp, oysters, clams or crabshells left over after a feast of boiled crabs. McCaughan uses a simpler method. Sheepsheads are delectable table fare and can be prepared using almost any cooking method: fried, sautéed in butter and garlic, broiled, in chowders and more. McCaughan prepares them as mock crab meat, tying strips in cheesecloth and boiling them for two or three minutes in crab boil seasoned with salt. Serve as is, or use to prepare a delicious crabmeat salad. At the end of their day fishing, Josh and Jared counted the hash marks that indicated the total number of sheepsheads they caught. “Ninety-one, 92, 93 ... 93 sheepsheads,” Jared reported. Not bad for two boys on their first saltwater fishing trip. I remembered the old saw about sheepsheads being sneaky and difficult to hook. Seems some myths die hard. Using the simple techniques suggested by Captain McCaughan, even a kid can load a boat with convicts. Looking for fishing shows on Outdoor Channel during the months of October – December? “The Hunt for Big Fish” and “Stihl’s Reel in the Outdoors” both air in the last quarter of the year. Check the schedule for updated air times.